Fantasy Football Running Back Start/Sit Rankings (Week 10) - Fantasy Football, Fantasy Football Rankings | Mac Bros.
*Rankings with detailed comments will be available Friday. Any additional updates that are necessary will be posted no later than Saturday in the final Week 10 (2009) rankings. 1. 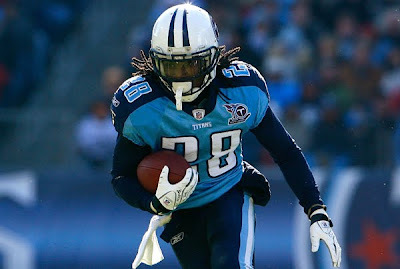 Chris Johnson (TEN) – He now leads all NFL RBs with 959 rushing yards in just 8 games. Johnson has been especially productive of late, rushing for 491 yards and 4 TDs in his last 3 games. He should add to those totals significantly in week 10 with an extremely promising match up against Buffalo. The Bills rank dead last in the NFL in run defense allowing 174 rushing yards per game and no team in the NFL gives up more fantasy points to opposing RBs. All signs point to a monster fantasy outing for Chris Johnson in week 10. 2. Ray Rice (BAL) – The last time Rice faced Cleveland in week 3, he totaled 75 yards on 15 touches and added a TD. At the time, Willis McGahee was still very much involved in the Baltimore game plan (vulturing Rice’s touches) and the Browns were actually healthy on defense. All things considered, Rice’s stat line against the Browns wasn’t half bad the first time around, but things have changed significantly since week 3 and Rice should fare much better against them in week 3. McGahee is a distant memory in the Ravens game plans and a beat up Browns defense can’t stop anyone in the run game. Cleveland ranks just 31st in the NFL against the run allowing 171 rushing yards per game. In addition, only the Bills and Raiders have given up more fantasy points to opposing RBs than the Browns. It should be a big Monday night for Rice whose consistency is unmatched among fantasy RBs of late. He has double digit fantasy performances in his last 6 games and has 5 TDs in his last 4 games. 3. Michael Turner (ATL) – He continues to rack up TDs on a weekly basis and the Falcons recently “adjusted” run blocking scheme is starting to pay huge dividends in the yardage department as well. Turner has rushed for 317 yards in his last 2 contests, including a 166 yard 2 TD performance against a fairly stout Redskins run defense last Sunday. Turner should keep that momentum rolling into a favorable week 10 match up against Carolina. The Panthers rank 23rd in the NFL in run defense and give up the 9th most fantasy points to opposing RBs. It also doesn’t hurt that Turner has a solid history of lighting this defense up. He has 222 rushing yards and 5 TDs against them in his last 2 contests, including a 105 yard 1TD effort in week 2 of this season. 4. Adrian Peterson (MIN) – We realize that this ranking may seem a bit low considering that arguably the NFL’s best RB is facing a Lions defense that is notoriously bad. However, the Detroit run defense is actually better than you might realize this season ranking mid pack in the NFL and oddly enough, Peterson’s track record against them over the last 2 seasons, while very good, is not nearly as stellar as it probably should be. We aren’t saying that he can’t or won’t rip them to shreds this time around, because he is certainly more than capable of doing so. We are just stating the facts and the three players ranked ahead of Peterson this week have better odds of success given those facts. Regardless, this is still a favorable match up for Peterson at home and even a worst case scenario should entail very solid numbers for him at the end of the day. 6. Thomas Jones (NYJ) – Jones has been a real workhorse of late rushing for at least 100 yards in each of his last 3 games, totaling 433 ground yards during that span. He should be well rested coming off of a bye and a week 10 match up against Jacksonville’s 22nd ranked run defense holds plenty of promise. He should continue his streak of 100 yard rushing efforts against the Jags and Jones is always a threat to find the end zone indicative of the 7 rushing TDs he already has in just 8 games. He is a must start fantasy option for week 10. 8. Frank Gore (SF) – He was more than up to the challenge on Thursday night against the Bears as Gore totaled 125 yards and scored the game’s only TD. Gore seems to be flourishing in the Niners new look “spread” offense and you can probably expect solid fantasy production from him moving forward. 9. Steven Jackson (STL) – We say it practically every week, but it truly is phenomenal that Jackson is able to produce at such a high level in such a terrible offense. Even with defenses locked in on him, he always manages to come through with solid numbers. If he could only start adding some TDs on a consistent basis, Jackson could fully regain his elite fantasy status. As for week 10, we like his chances against a struggling Saints run defense. New Orleans started out the 2009 season with one of the better run defenses in the NFL, but some key injuries have caused their stock to plummet of late as they have been terrible in their last 2 games. As usual, Jackson will be the focal point of their attention and as usual, we expect him to come out on top and another trip to the end zone is not out of the question against this rapidly declining defense. 10. Ronnie Brown (MIA) – While Brown hasn’t exactly been at the top of his game against two very solid run defenses the last two weeks, we fully expect him to bounce back in week 10 against a very generous Tampa Bay run defense. The Bucs rank 30th in the NFL against the run and they tend to give up plenty of fantasy points to opposing RBs. Brown, “The Wildcat”, and fantasy owners alike should have a field day against this defense at home in week 10. It’s just too bad that Brown will have to share the wealth with Ricky Williams. 11. Pierre Thomas (NO) – Slowly but surely, Thomas is starting to make up ground on his elite pre-season draft status. In his last 2 games, he has 181 all purpose yards and 3 TDs. He should keep that momentum rolling into a very favorable week 10 match up against the Rams. St. Louis gives up 135 rushing yards per game on average, ranking them 27th in the NFL and they rank 4th in the league with regard to fantasy points allowed to opposing RBs. Thomas will continue to share the workload with Reggie Bush and Mike Bell, but his role seems to be increasing and there should be plenty to go around for everyone against a generous Rams defense. 12. Cedric Benson (CIN) – He could have a tough row to hoe in week 10 against the NFL’s top run defense, but as he has proven time and time again, the tougher the opponent, the better his numbers tend to be. In fact, Benson has already set a precedent for success against the Steelers totaling 81 yards and a score against them in week 3. It will be a tall order for him to exceed those totals against the Steelers this time around on the road, but we have learned to never count him out against anyone. He should be fresh coming off of a bye week and Benson is capable of doing some serious damage, even against the Steelers. That said, your expectations should not be through the roof given the difficulty of this match up. 13. Rashard Mendenhall (PIT) – He is starting to open some eyes in fantasy circles as Mendenhall ran all over a stout Broncos defense on the road last Monday night. Mendenhall will be in for yet another tough test in week 10 as he faces a Cincinnati run defense that ranks 2nd in the NFL. The Bengals have one of the stingier run defenses in the league, but Mendenhall is talented enough to find success in this match up. It doesn’t hurt that the Steelers have a very potent passing attack that can create scoring opportunities for him and while this match up isn’t fail safe, we like Mendenhall’s chances in week 10. 14. Ricky Williams (MIA) – His numbers have died down a bit in the last couple of weeks, but that’s nothing a promising week 10 match up against Tampa Bay can’t fix. The Bucs rank 30th in the NFL against the run (164 rushing yards per game allowed) and they tend to give up plenty of fantasy points to opposing RBs. As usual, Williams will have to share the spoils with Ronnie Brown, but both players should excel with the “Wildcat” against this leaky defense. Plus, this just has the feel of one of those big Ricky Williams’ weeks. He should make for a solid RB2 fantasy option. 15. Ryan Grant (GB) – It’s difficult to get overly excited about his week 10 match up against a fairly solid Cowboys run defense, but Grant has been consistently solid in his own right this season. He has posted double digit fantasy efforts in 7 of 8 games and there is little reason to believe that he will go bust against the boys in silver and blue at home. That said, you probably can’t expect Grant to wow you with his performance this week either. He earns RB2 status for week 10. 16. Joseph Addai (IND) – He is coming off of his best fantasy performance of the season in week 9 and while he has yet to rush for more than 64 yards in a game all season, Addai is already surpassing expectations with regard to fantasy football in 2009. As long as Peyton Manning is under center for the Colts, Addai is going to have an opportunity to be a productive fantasy option. It is clear that Addai isn’t going to put up monster rushing yards against anyone, but the Colts high powered passing game always seems to put him in a position to score and/or utilizes his talents as a receiver out of the backfield. Addai will have his work cut out for him in week 10 against a Patriots defense that has only allowed 2 rushing scores all season, but thanks to Manning, Addai should find a way to put up decent numbers once again. Our best guess is that he will benefit most in the passing game this week as the Pats will almost certainly focus their attention on stopping Reggie Wayne and Dallas Clark. This should open up some opportunities for Addai to showcase his receiving skills. 17. Matt Forte (CHI) – As has become the norm with Forte this season, he was unable to produce much of anything in the running game in a Thursday night loss to the 49ers. That said, there is a silver lining as Forte had a career best 120 receiving yards on 8 catches. There may still be hope for Forte this season as Cutler has looked his way early and often the last 2 weeks in the passing game. Unfortunately, this is something that should have been happening all along and now it’s simply too late for many fantasy owners. 19. Laurence Maroney (NE) – While he can be very difficult to trust as a fantasy option due to the Bill Belichick factor, Maroney should continue in his recent role as the Pats feature back in week 10. At least, that is what the last few weeks would suggest. Sammy Morris is doubtful at best and Fred Taylor is out for sure due to injury, Kevin Faulk comes in on the occasional passing down and BenJarvus Green-Ellis has barely seen the field. That pretty much leaves Maroney to carry most of the load and he should be fairly effective in doing so. The Colts have shown major improvement against the run as the season has progressed and they rank just outside the top 10 in the NFL in terms of fewest fantasy points given up to opposing RBs. That being said, Maroney is talented enough to get the job done and he has a potent passing attack that can create goal line opportunities for him. 20. Tim Hightower (ARI) – As we have stated before, Hightower can be a bit risky due to the unpredictable nature of his workload, but the fact remains that one way or another, he’s probably going to put up solid numbers in some capacity. In week 10, he will face a good, but not great, Seahawks run defense. The good news is that Seattle’s ability to limit his ground yards is somewhat irrelevant as Hightower typically supplements a lack of rushing yards with TDs and quality production in the passing game.